To expand the video, please click the icon on the lower right hand corner of the video. You may start and stop the program as often as necessary. After you have completed the training program return to this page, complete the contact information, and answer all questions on the final examination. Upon completing the contact information and examination click on the Submit button and your answers to the examination questions will be sent to The JTS Association for scoring. You will be notified if you passed or failed the examination via email. If you have passed, please report to the assessment site on the day and at the time identified. You will be issued your certificate of training at that time. If you fail the examination you will be notified and may elect to review the program again and re-take the examination. A job task analysis and a job description are different terms for the same item. A Job Task Analysis for a position / rank could produce up to _______ different behaviors or dimensions. Typically an assessment includes _______exercises or activities. A procedure that just requires a candidate to choose from several choices provided is an acceptable assessment method. While two assessors in an exercise is acceptable, the use of three assessors per exercise is preferred. 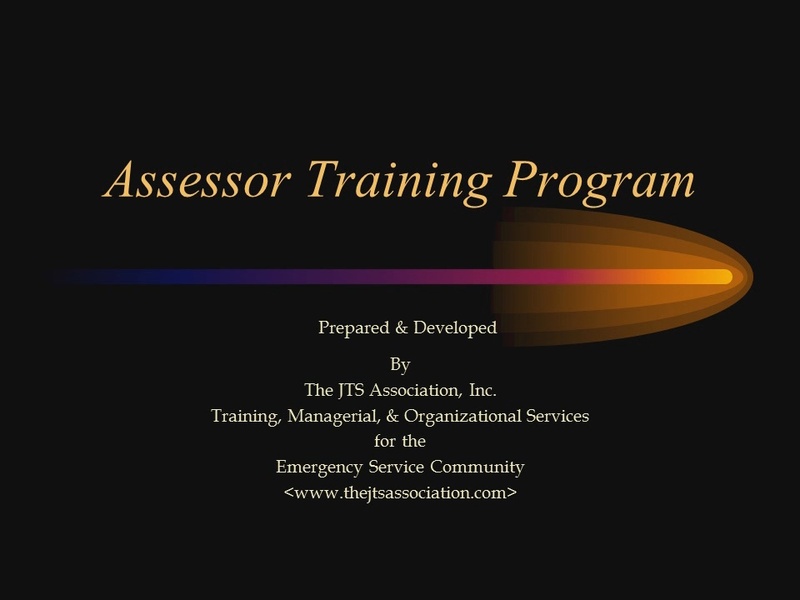 Upon completion of the Web based assessor training provided by the JTS Association, an assessor is completely prepared to begin functioning as an assessor. If a candidate demonstrates a thorough knowledge regarding the subject / issue, however, the base of knowledge or its application to the situation could be stronger, the candidate should receive a score of ___________. Determining the score of a candidate is a three part process. Assessors are provided a picture of each candidate prior to the candidate starting an exercise. A candidate has __________ minutes preparation time for an exercise. Assessors are provided ___________ minutes to complete their notes and mark their individual scores for each dimension being evaluated after a candidate completes an exercise. If you recognize a candidate that you know very well, you should immediately announce this fact to the other assessors and absent yourself from scoring that candidate. There are _________ basic exercises that are typically included in an assessment. Candidates are typically provided _________ minutes of preparation time to one minute of presentation time in a presentation exercise. Other types of exercises that are generally designed for chief officer assessments include 1) staffing exercises, and 2) in-basket exercises.